Johnnie has been painting since she was a child in Charleston and in love with horses. When she wasn’t riding them, she was drawing them and painting pictures of them. Her family would escape the hot Charleston summers to Black Mountain, and when she had the chance to transfer from her job in Charleston working for Haverty’s to the location in Asheville, she jumped at the chance. She still enjoys her work at Haverty’s where she advises clients on design choices. She has been living in Asheville for the past seven years and is a member of the Swannanoa Valley Fine Arts League. It’s really remarkable that she is able to paint, because she fell seven years ago and broke her wrist badly. The doctors told her that she would never regain use of her hands. Her daughter wouldn’t hear of it and demanded that Jonnie continue trying to retrain her hand. Johnnie turned to graphic design and photography, but never gave up trying to get her hands to do what she wanted. And today her work is as fine as it ever was. Last year she contributed a painting of a pick-up truck to the rocking chair project. On the day of the auction, the weather was bad and few people showed up to bid on the chairs. An out of town couple really wanted the chair, but were leaving town right away, and they convinced them to let them to let them bid early and leave with the chair. Later in the day, other folks who had had their eye on the pick-up truck chair arrived and were crushed that they had missed their chance to bid. Johnnie offered to paint another similar truck for them and sold it to them for the price the original chair had sold for. 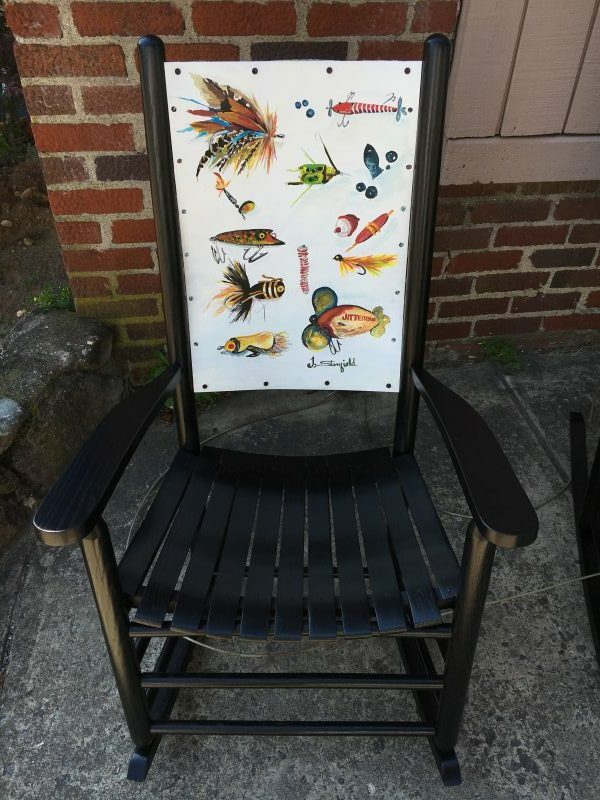 This year her chair features some intricate images of fishing lures. She was inspired by her brother who suggested she look for subjects that would appeal to men: hunting, fishing, and ’68 Mustangs. She researched lures, did some studies of lures, and gave two to him. He was delighted, and the lures evolved into a series. Johnnie’s work can be found at The Red House, and she is currently working on a huge mural in Asheville.